Bon-vivant beaver brothers Norbert Foster and Daggett Doofus continue their sidesplitting adventures in this uproariously funny 2-disc collection. Features an all-star voice cast, including Richard Steven Horvitz, Nick Bakay and Charlie Brisette. Bon-vivant beaver brothers Norbert Foster and Daggett Doofus continue their sidesplitting adventures in this uproariously funny 2-disc collection. Watch these two wild bachelors take the town in such memorable episodes as "Kreature Komforts," "Das Spoot," "Practical Jerks," "Euro Beavers," "Finger Lickin' Goofs" and more! Season 3 Part Two will be released on DVD August 14th, 2012 with a suggested retail price of 19.93. Join in the revelry as you laugh your way through the final 11 episodes of Angry Beavers hilarious third season! 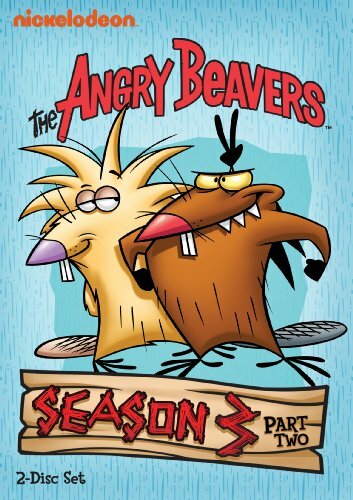 The Angry Beavers features an all-star voice cast, including Richard Steven Horvitz (Mighty Morphin Power Rangers), Nick Bakay (Sabrina, The Teenage Witch) and Charlie Brisette (The Ren & Stimpy Show).